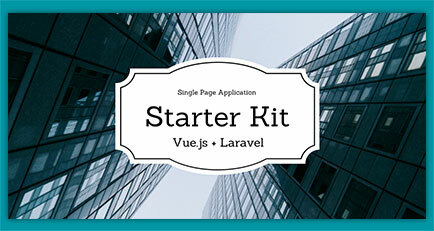 Codecast's Single Page Application Starter Kit is a package which contains two separate projects to act as a starting point for a Single Page Application: a Vue.js project (created with vue-cli and webpack template) and a Laravel 5.3 project. They're not just freshly created projects but a fully working application that can be modified and expanded to become your own application. Make sure you have installed Node and Yarn (latest versions) as well as PHP 7 and MySQL. Check it out on GitHub and a demo.